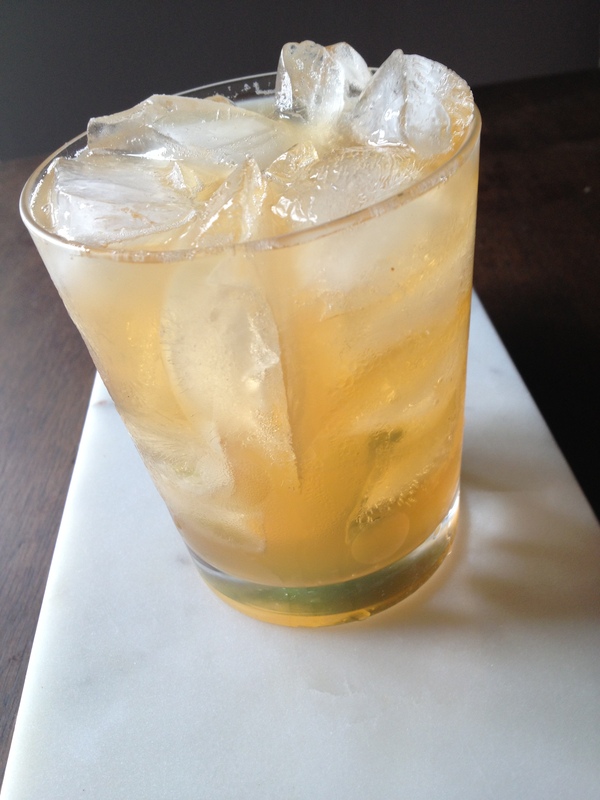 At the end of May I wrote a piece about home-made tonic since then I made two more recipes in an attempt to try to conquer the perfect tonic. What I’ve learned is: homemade tonic varies greatly and can take some time to find the right balance for you. There are two basic techniques – boil all the ingredients in a sugar syrup or make a “tea” with all the ingredients then add sweetener. I think the latter is better because it gives you a lighter colored tonic which you can adjust the sweetness of to your liking. Because both of the two tonic waters I made called for powdered cinchona bark the filtering process was not inconsiderable – in the case of Kevin Ludwig’s recipe it is suggested by the Food Dude at Portland Food and Drinks that a 5 day waiting period is called for to let the sediment rest to make the filtration process easier. 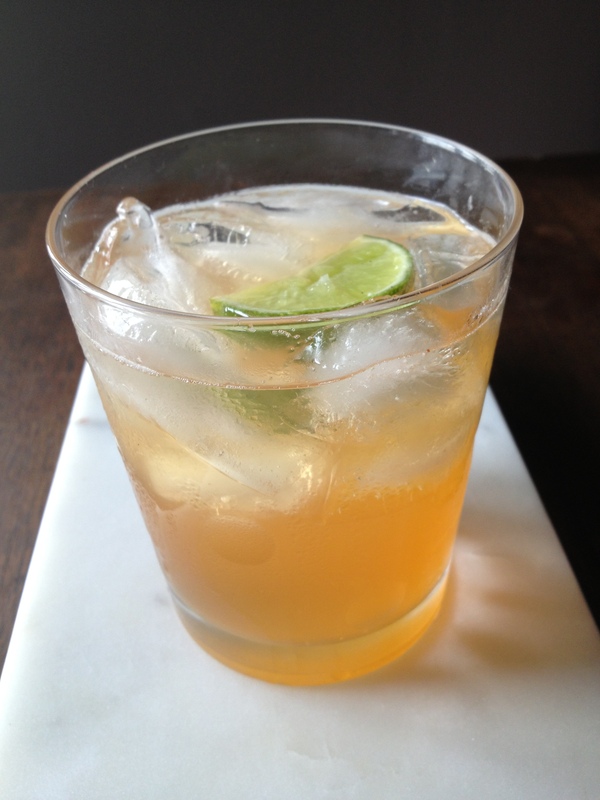 I found this recipe to have an intense bitter lime flavor with a strong quinine presences. Of the 4 friends who helped me do a tasting, only one person preferred this one. The winner was Jeffrey Morganthaler’s which I modified (of course). Jim Meehan of PDT whose Tonic Syrup I initially wrote about and was disappointed with has turned in to a really lovely lemon lime syrup to serve friends who don’t want booze. The other thing I now really appreciate about Mr Meehan’s recipe is the use of whole not powdered cinchona. If you could use the whole bark it would make the entire process much easier and eliminate the endless straining. The addition of Grapefruit to my recipe gave the tonic a distinctly grapefruit aspect – which I liked, but again there is a lot of room for play here and if you decide to try this I highly recommend you take a deep breath and realize that it will take several tries before you find the one that is perfect for you. The use of a French Press to help strain the mixture was helpful, tho after 2 days of sitting there was sediment in the bottle (which was easily filtered out). Options abound when it comes to what to add to home-made tonic – from bitter Oranges to Lavender I found the thing that I couldn’t get out of my head was the taste of the tonic that I grew up with, which is made with chemically extracted quinine (which is what gives it that lovely opalescent aspect) and GM High Fructose Corn Syrup. In a heavy bottomed non-reactive pot add 4 cups of Water, 1/4 Cup Cinchona bark, 1 Cup of Chopped Lemongrass (remove an inch off the bottom, three inches off the top of each lemongrass and then before you remove the tough outer skin pound the stalk with the fat edge of a knife or a mallet to help extract the flavor) the zest and juice of 1 Organic* Lemon, Lime, Orange and Grapefruit, 1 heaping teaspoon of Whole Allspice, 10 Green cardamom pods, 1/4 Cup Citric Acid, and 1 teaspoon sea salt or kosher salt – bring the mixture up to a boil reduce heat and simmer 20 minutes (*get Organic if possible and always wash the fruit well before you peel it). Let this mixture cool to room temperature. Strain through a fine sieve, then place in batches into a French Press and strain again. Finally pour the strained mixture through cheese cloth folded in 4. There will still be sediment which you can remove as the syrup sits and settles. 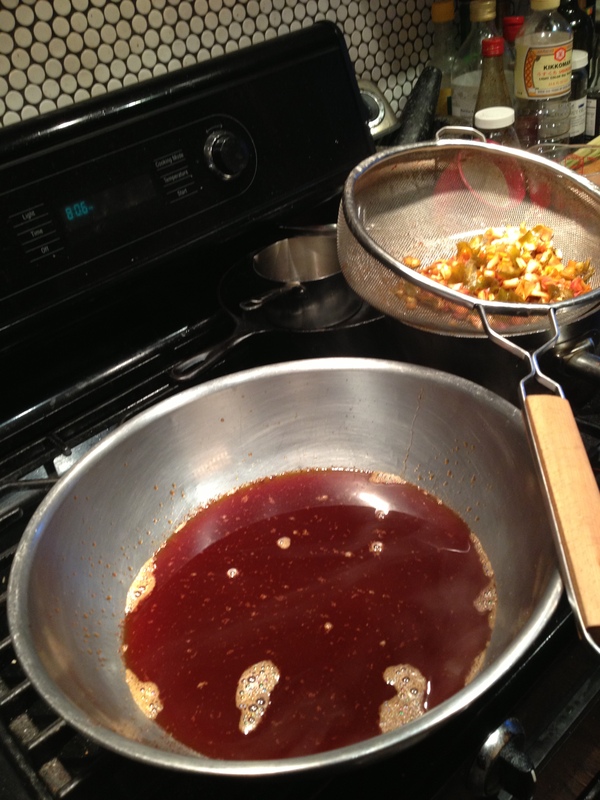 Measure the liquid and pour it back into the pot, add 3/4 cup of Agave Syrup for every cup of liquid. Heat over medium until the Agave has melted then using a funnel our into a resealable container. There you have it: mix 3/4 ounce of syrup with 2 ounces of soda water and 2 ounces of Gin squeeze in a generous wedge of Lime and enjoy! 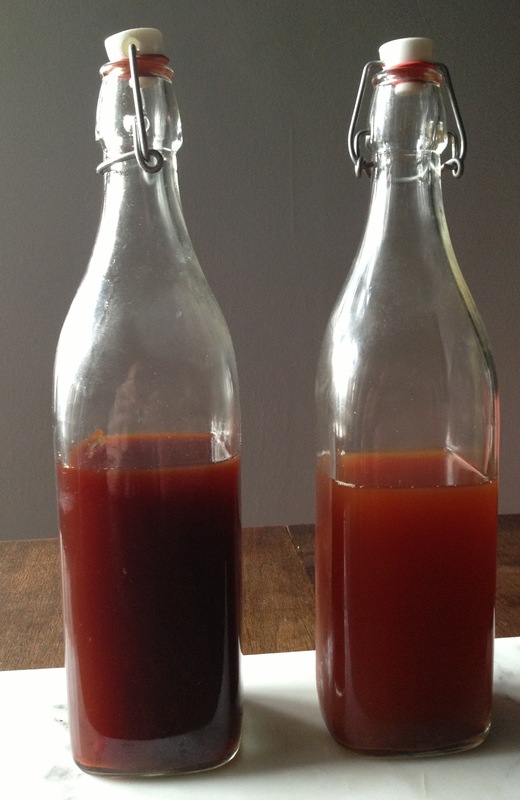 The syrup on the left is Kevin Ludwig’s recipe and the syrup on the right is my adaptation of Jeffrey Morgenthaler’s notice how much lighter the later is. My thoughts for the next round of Tonic Syrup experimentation is the use more cardamom, maybe only half a grapefruit rind and most importantly to try to figure out a way of making it with cinchona bark not powder – my guess is you need to use a cup of bark and let is sit longer – the only downside to this that I can figure out is that it makes it more expensive (Cinchona bark is $9.20 for 4 ounces plus shipping it cost me $15.15 from Pennherb.com) still given the boutique nature of homemade Tonic I for one would be willing to splurge. 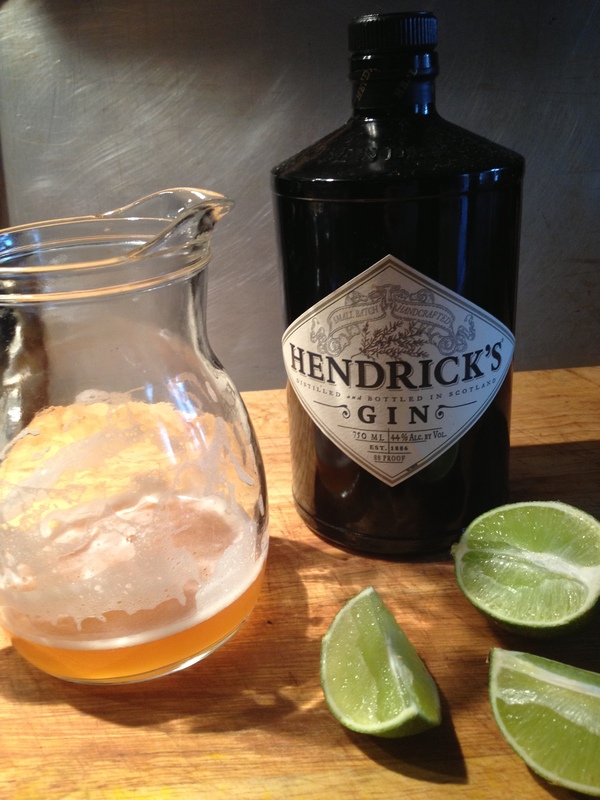 Homemade Tonic Syrup is much more distinct than commercial stuff so it requires a Gin with more umph than the usual Tanquery – I use Hendricks and find it to be a very delicous match. Cheers! This entry was posted in Other Stuff, Recipes and tagged Gin and Tonic, Hendricks Gin, Home-made Tonic, Jeffrey Morgenthaler, Jim Meehan, PDT, Pennherb.com, Portland Food and Drink, Tanquery Gin, tonic syrup, Tonic Water. Bookmark the permalink.